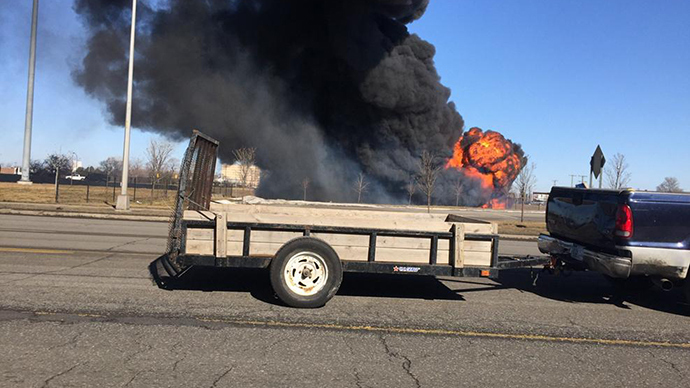 A tanker has caught on fire after a blast on I-94 near Detroit, local media report. Both directions were closed for several miles following the incident in Dearborn, Michigan. At least two other vehicles caught on fire after the tanker exploded at around 11 am local time, WXYZ Detroit reports. Flames also started coming from sewer system manholes. The tanker was carrying 6,800 gallons of gasoline and 5,800 gallons diesel fuel, fire officials told WWJ. It took nearly two hours for the firefighters to sustain the blaze. Two patients were treated for minor injuries at Oakwood Hospital in Dearborn, officials said. "We have located all of the people, we have taken one to the hospital and everyone else had minor bumps and bruises," Dearborn Fire Chief Joseph Murray told Channel 7 News. Witnesses told local media they heard several explosions and felt buildings shake. Mishaun Thompson, a driver, also told WXYZ that she saw a vehicle flip over the median onto the west side of the freeway. The tanker truck driver managed to safely escape. The vehicle belongs Rex Carriers trucking company. The freeway is to remain closed for an indefinite amount of time. The public is asked to avoid the area.